Predictive Workforce allows you to use valuable data from your business to predict how many staff you should have rostered on. First, you'll need to connect your Sales & Revenue system and configure the data in Tanda. For detailed instructions on how to do this, you can follow the steps in this article: Import your Revenue Data. In the example above, we have Restaurant Bookings and Sales data feeding into Tanda and we have linked them with our Team: Front of House. 2. Set Rostering Ratios - this tells the rostering model how many staff you require per data source, set in 15 minute increments. You just need to have at least one Data Stream Card with a ratio set to turn on Predictive Workforce, however you can adjust the figure if it's not quite right once you're in the Roster. At this point, if your Roster doesn't show like it does above, you might not have configured your Data Stream Cards correctly or set your Ratios. Revisit this article, or contact Tanda Support on the details at the bottom of this article for assistance. Before looking at rostering the predicted shifts, you can apply some settings to ensure the prediction best suits your business. This allows you to set which historical time data is used to assist in forming the basis for the prediction. You can either select an Average of a particular Day and the number of weeks or a Specific Date in the past. If you use the Day average, below this you can then set how many weeks worth of data you want to use to make the prediction. If you use a Specific Date, you can use the calendar date picker. This is useful if you want to use an event where you know it was busy to model against the current roster i.e State of Origin nights, Boxing Day etc. In the example above, the business is open from 11am to 11pm. Now you have configured the data you can look at what the Predictive Workforce information means. There are two ways to view your data, using the graph or using the table. Both display the same information, just in different ways. You will also see the Ratio that you set in the Data Stream Management page reflected here. If you don't think you've set the Ratio quite right, want to change it or play around with how changes affect predicted shift numbers, just change the number and you'll notice the Staff Required number change. 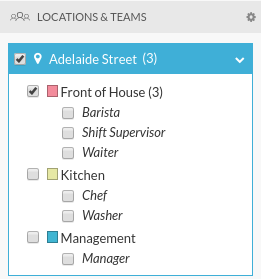 The row below is based on the Team selected in the filter on the left, how many staff are required across the day. Here you'll be able to see a visual display of your projected staff, as well as a visual comparison to your rostered staff. 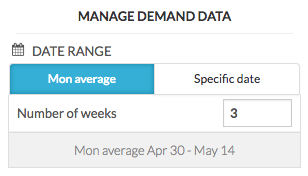 Once you've set your Ratios and Manage Demand Data settings, you can build your required shifts below. Add your Start and Finish times and set break times if needed. For the table, as you build shifts you'll start to notice your Required staff at the top will change and the graph will update. 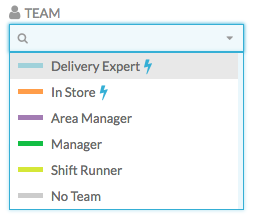 You don't need to stress about having all the boxes grey to show you're staffed just right, it's not always possible to roster perfectly, as you might need to roster staff longer than needed to meet Award minimum shift conditions. For the graph, as you build shifts you'll notice the actual staff line will move up and down to match your rostering. 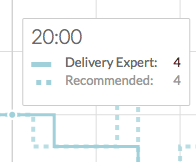 Hover over the graph to see a breakdown of predicted vs actual staff count. You can use the graph to compare your data to your rostering. 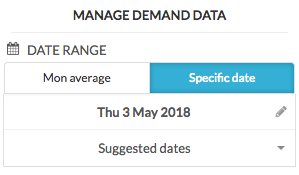 Once your current day Sales data has imported, you can see whether the prediction was accurate or whether there were events that occurred that day that need to be taken into account for the same day next week and you could alter your ratio or settings. You can select from a variety of sources in the panel for these comparisons e.g. Team vs Actual Sales, Expected Sales vs Total Staff or Expected Sales vs Actual Sales. You can change your Ratios and Demand Data for each individual day, or keep them the same, depending on how your business operates.